Board Of Secondary Education of Telangana State has announced 10th class exam official dates/schedule 2018. 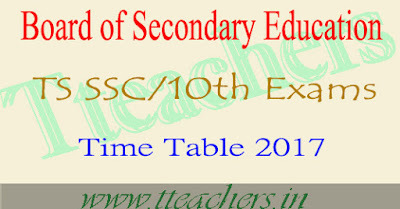 You can download Telangana SSC Time Table 2018 from online official website.As Per official notification, TS 10th Exams 2018 starting From 15th March, 2018 to 31st March, 2018. Telangana ssc exams will be conducts in several schools Center wise. 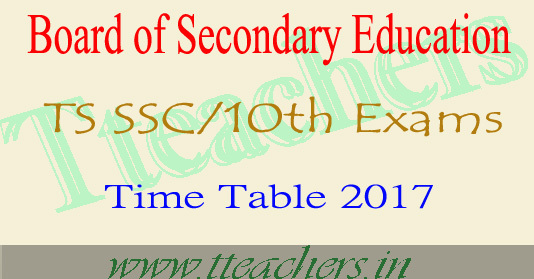 The Official Time Table of TS SSC Dates 2018 Download from below given links. TS 10th Board has announced 10th class exam dates for the academic year 2017-2018 on Nov 2018.They has decided to conduct ssc exams in the month of March 2018.Telugu Hindi,English ,Mathematics ,Physical Science,Biological science and Social exams dates are given from the following table. The Objective paper in the subjects in which they are given have to be answered in the last half-an-hour only. SSC Public Examinations, March, 2016 will be conducted strictly as per the above time table even if the Government declares Public Holiday or General Holiday in respect of any date / dates mentioned above. The performance of the candidates who answer wrong combination of question papers will be cancelled. Hence the candidates are held responsible for demanding / answering wrong question papers. The Performance of the candidate in the examination will be cancelled, if the candidate appears in the examination centre other than originally allotted by this office.